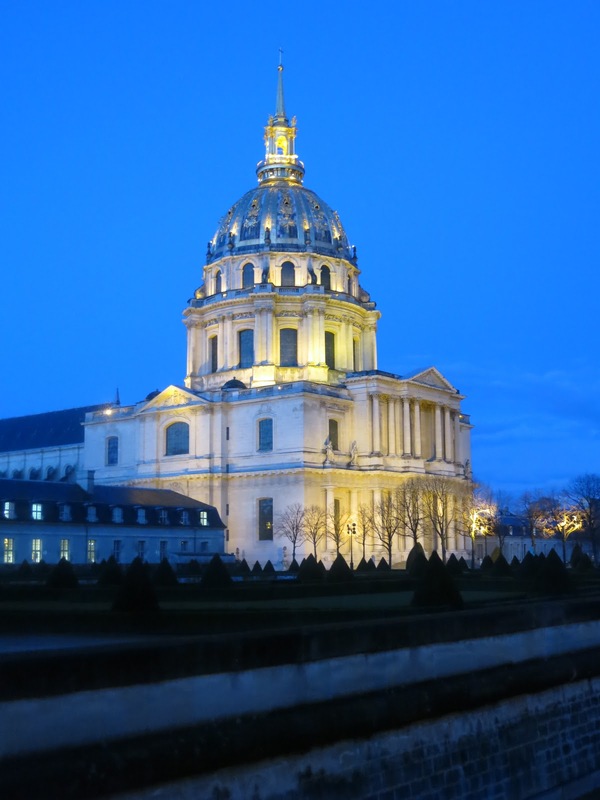 As readers of this blog and Reggie's friends on FaceBook will know, I have just returned from a delightful holiday in Paris. 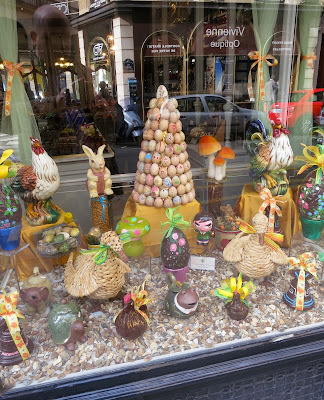 While I was there I was enchanted by the decorations of the city's store windows, dressed in anticipation of Easter. I took a number of photographs of my favorites while I was there, Dear Reader, along with snaps of other things that caught my fancy. Today's post, the first in a two-part series, features a selection of those images. I hope you like it. Paris is justifiably famous for its flower stores. I was thrilled by these beautiful lavender roses. As I was amused by this carton of white, milk, and dark chocolate eggs. So clever! 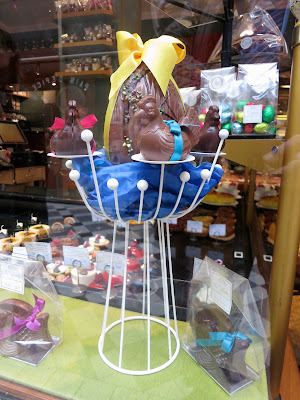 The windows of Meert, in the Marais, featured a lovely selection of foil-covered chocolate eggs. So pretty! I loved this "mod" Easter display in one window. 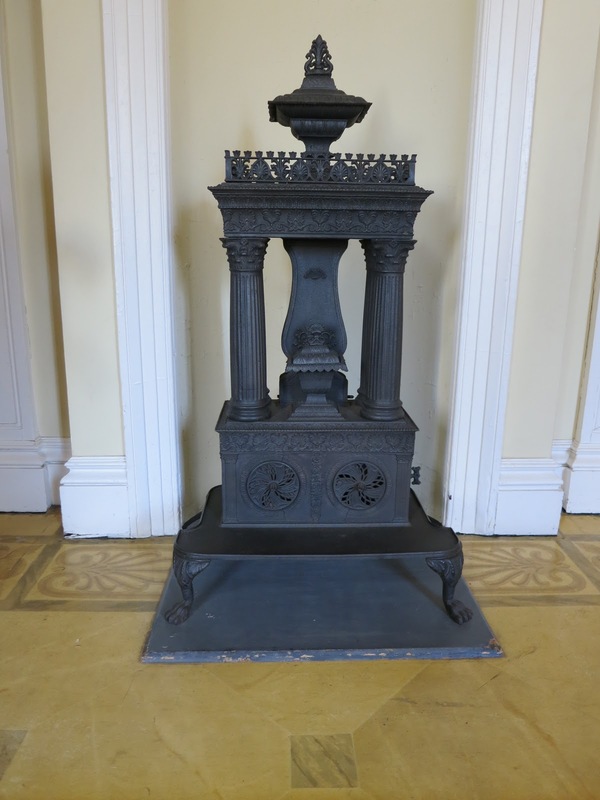 The white metal stand is at least two feet tall! What little girl wouldn't love a present of this pretty dress-up frock? 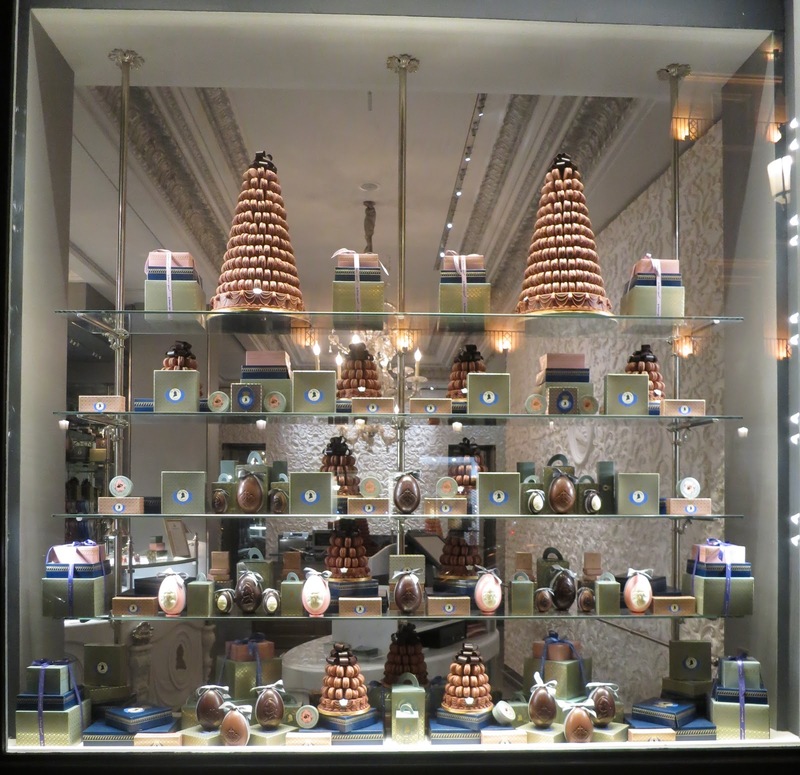 The windows of Les Marquise de Ladurée on the Place Vendôme featured enormous chocolate eggs, topped with chocolate ribbons. The insides of each include a tower of macarons. I was wild about them. Of course seeing all those chocolate eggs made one long for the real thing, too. Fortunately, one was able to do have them at breakfast at Les Ambassadeurs at the Hôtel de Crillon one morning. 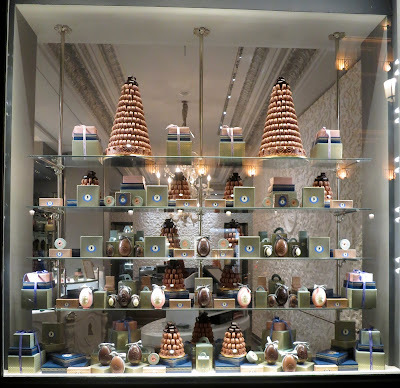 Another window at Les Marquise de Ladurée. 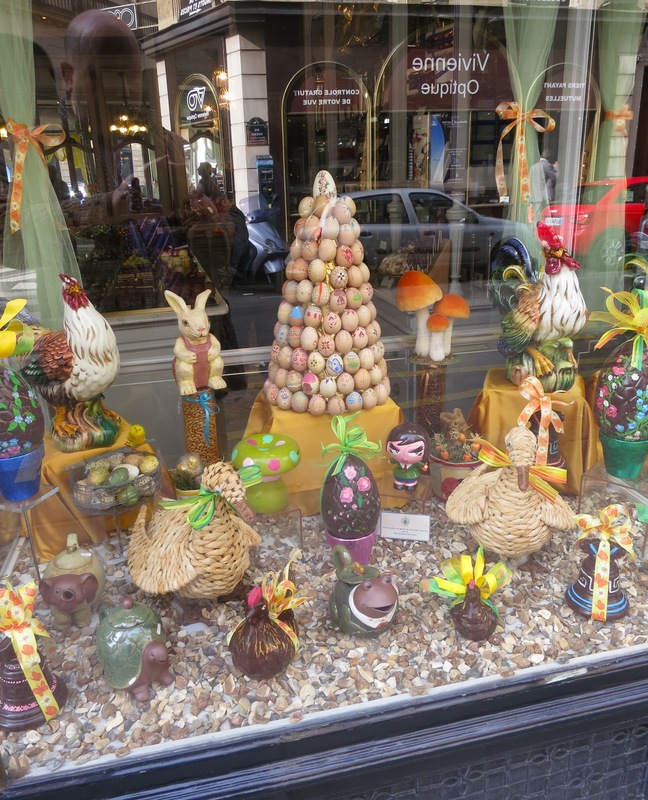 I think the French really do the most marvelous store displays imaginable. 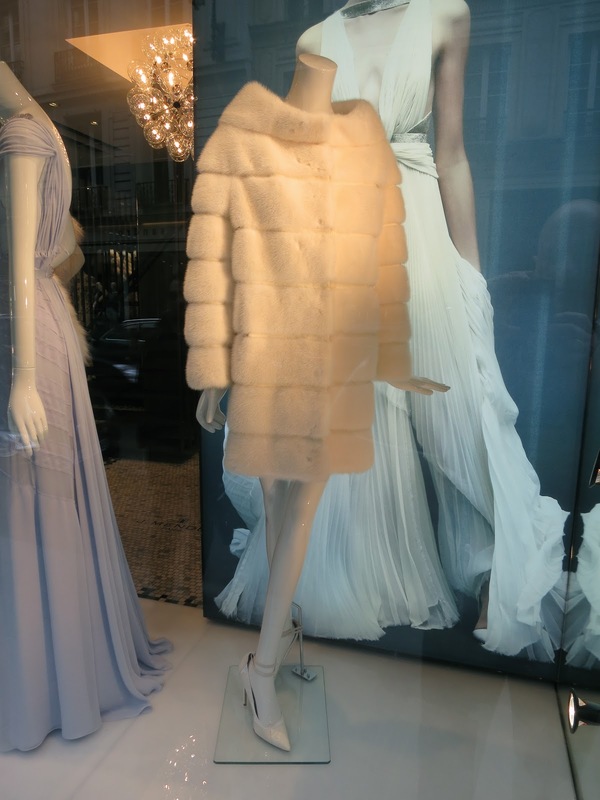 Although the weather was relatively balmy when we were in Paris, there were one or two evenings when any lady visiting the city would have appreciated slipping into this elegant cream mink coat that we saw in a window on the Rue de Faubourg Saint-Honoré. 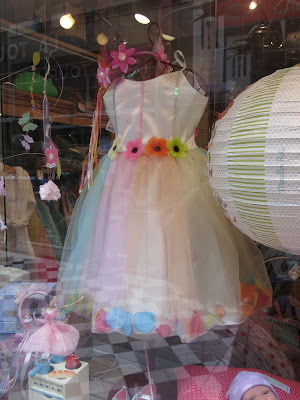 Perfect for spring, non? 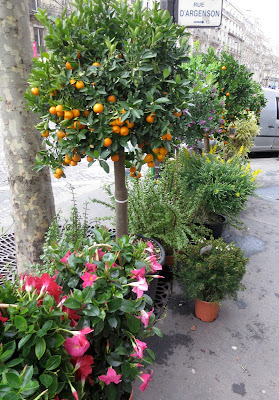 These topiary trees laden with oranges seen on the sidewalk one day made me long to have an orangery at Darlington House! 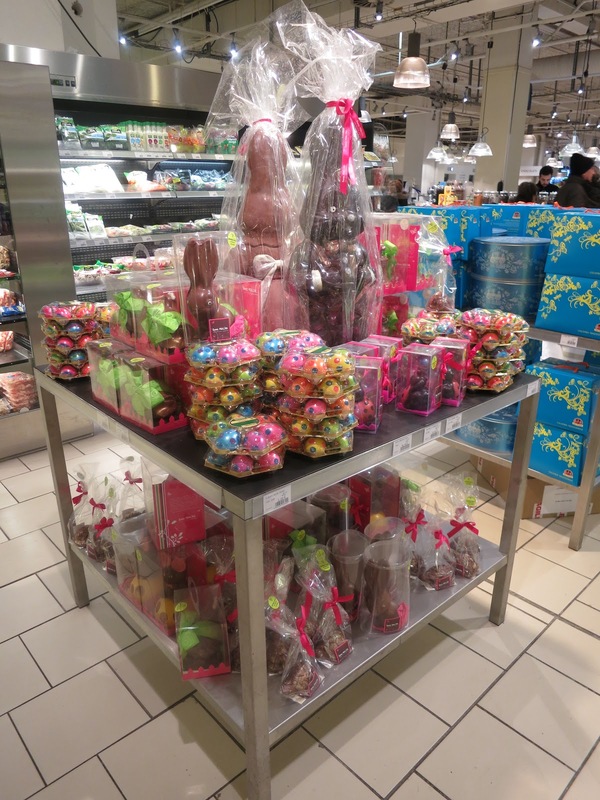 There were many temptations at La Grand Epicerie de Paris at le Bon Marché Rive Gauche, including this table of cellophane-wrapped chocolates. This little lamb is actually a powder sugar-dusted cake. What will they think of next? Perhaps "they" will think of coating these chocolate eggs with butter cream candy decorations, as this chocolatier did? Or why not blow out the yolks of real eggs and fill the shells with chocolate ganache? I almost fainted when I saw these! 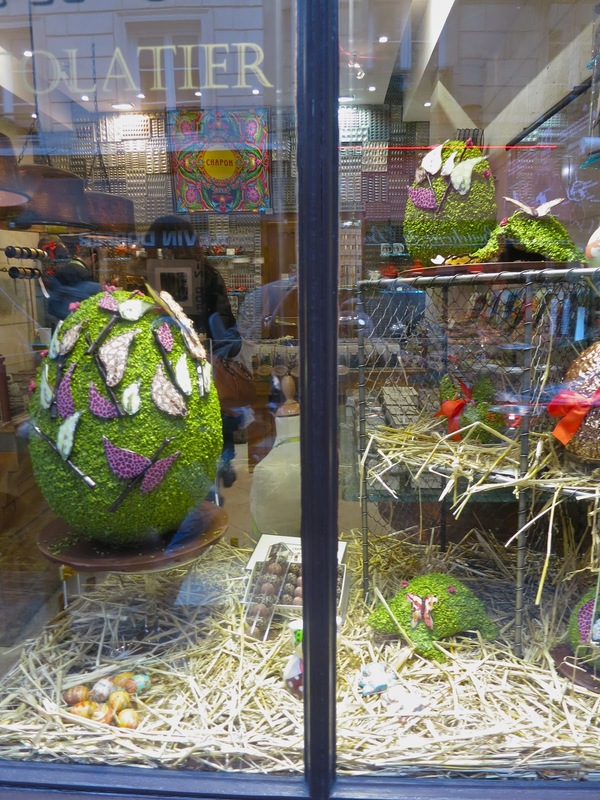 The Easter flower display in the lobby of the Hotel George V was suitably restrained. So chic. 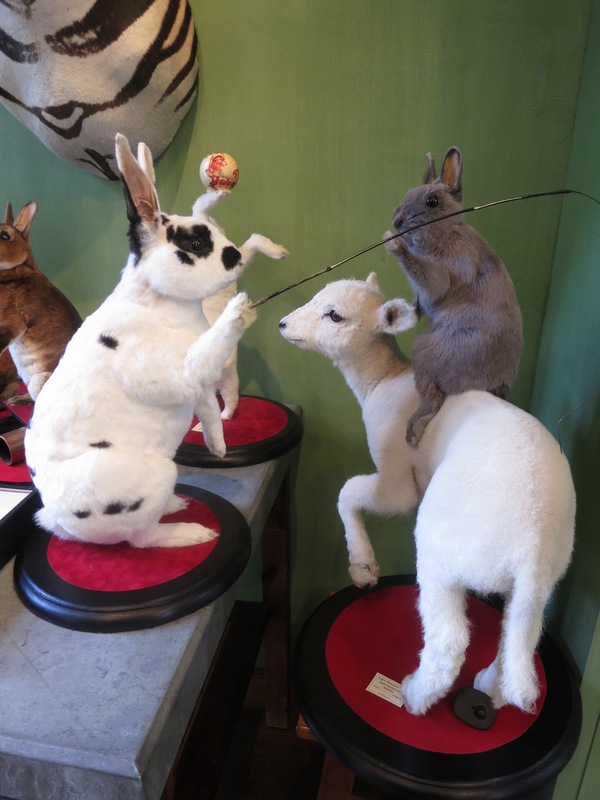 Can you believe the crazy whimsy of these stuffed bunnies and lamb at Deyrolle? I loved them! 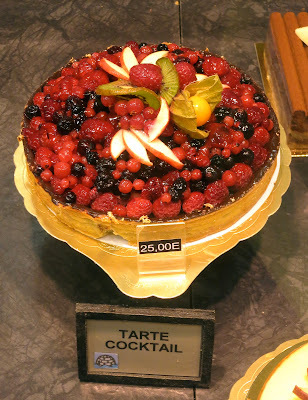 After all that visual excitement, I thought I might need a piece of this Tarte Cocktail to calm my nerves. Better yet, I think I shall sit down in this elegant fauteuil, collect myself, and plot out where I shall go next. Champagne is definitely in order . . .
Reggie has been on holiday in Paris this week, and has been posting about it on his Facebook page. 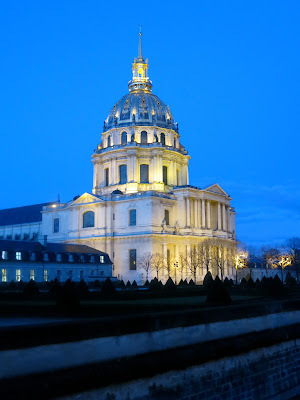 If you haven't "friended" me on Facebook yet, I encourage you to do so, as I would enjoy sharing my exploits in the City of Light (among my other FB musings) with you. You can find me on Facebook here. As should come as no surprise to his readers, Reggie rather enjoys visiting historic house museums. He has happily done so his entire life, starting from when he was a boy growing up in Washington, D.C., a metropolis rich in historic house museums both within its boundaries and in the surrounding counties of Virginia and Maryland. Reggie visits historic houses because he appreciates the beauty of their architecture and contents, their historical significance, and the window they provide on how this country's elite lived in earlier times. The decoration of such houses has, in some cases, informed Reggie's choices in furnishing his own residences. This past weekend we found ourselves in Manhattan, again, instead of at our beloved Darlington House in the Hudson River Valley. With a lazy two days ahead of us with no appointments or obligations we decided to visit a number of the city's historic house museums. New York is blessed with (or burdened by, depending on who you are speaking with) a large collection of historic houses open to the public, many of which are located in its public parks. 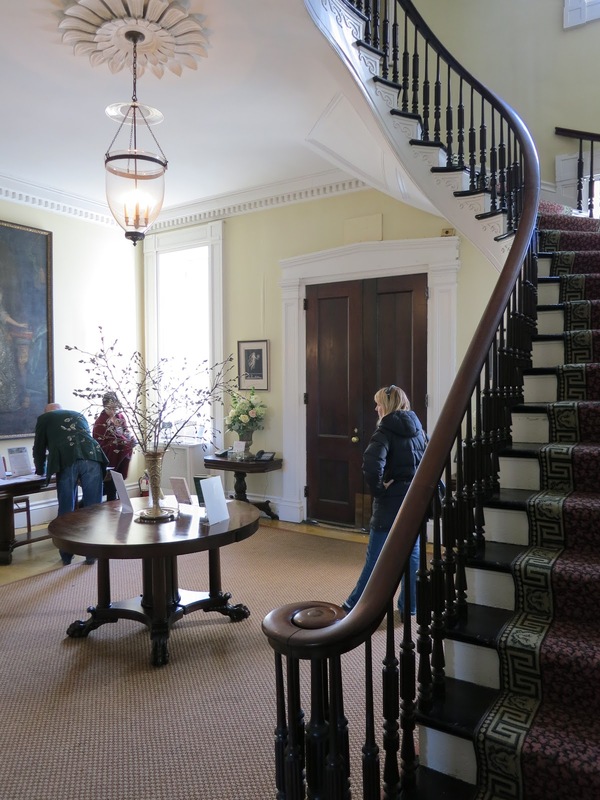 Most are operated in tandem by the Historic House Trust of New York City and the City of New York Department of Parks & Recreation. 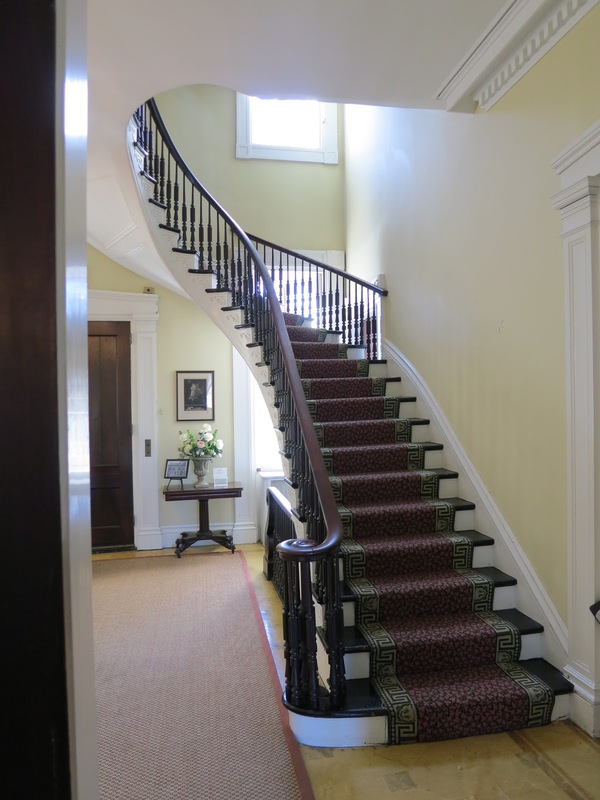 The Historic House Trust of New York City is a worthy, not-for-profit organization that provides essential support for houses of architectural and cultural significance that reside within the city's parks and that are open to the public. 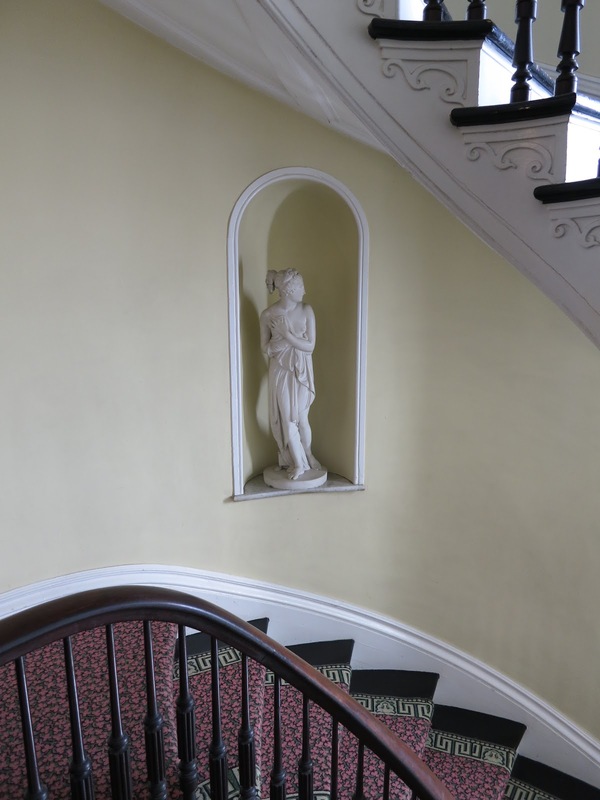 The Trust has rescued many of the city's house museums from dereliction in recent years, a period in which the City's resources available for supporting such institutions has dwindled. Reggie is most grateful that the Trust has stepped up to the plate to ensure the survival of these house museums. 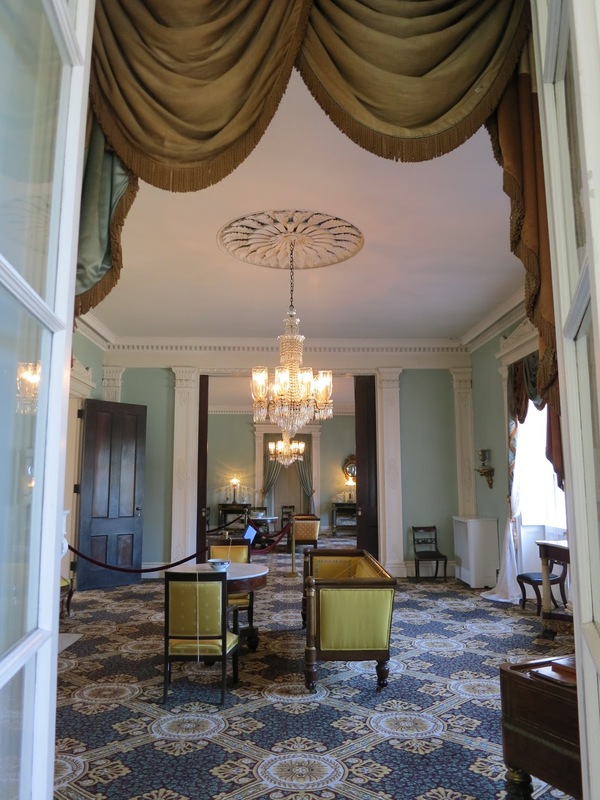 Reggie encourages his readers to consider making a donation to the Historic House Trust of New York City (see link above), as it relies on support from the likes of Reggie and his fellow travelers. Now, getting down to the inspiration for this posting. 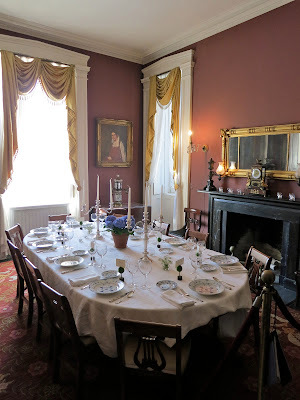 The first house we visited during our city weekend was the Bartow-Pell Mansion Museum in Pelham Bay Park, in the Bronx. It was an easy half hour's drive from the UES of Manhattan. The Bartow-Pell Mansion sits on a handsome parcel of land facing east across Pelham Bay toward Long Island Sound. The land on which the house stands was purchased by Thomas Pell in 1654 from the local Siwanoy Indians, and is at the core of what had once been the 10,000 acre Manor of Pelham. Thomas Pell's nephew John Pell built a house near the site of the present mansion in 1671, in which four generations of Pells lived until the manor was divided shortly after the Revolutionary War. In 1836, Pell family descendant Robert Bartow, a well-connected, wealthy publisher and printer from New York City, purchased part of the original manor and built a grand house in the then fashionable Greek Revival style. The imposing gray stone house is composed of a three-storey main block flanked by two wings, and is what is today known as the Bartow-Pell Mansion. Let's go upstairs and see what's up there! When the house was built the surrounding area was bucolic and undeveloped save for a number of other large country estates belonging to the city's elite. The house stood among pastureland, orchards, and lawns sloping down to Pelham Bay. The Bartows divided their time between their country house and a townhouse in Manhatttan, where they spent the cooler months of the year. Mr Bartow and his wife, the former Maria Lorillard, had seven children. The house remained in the Bartow family for fifty years, by which time the area was no longer as desirable as it once had been for those seeking the serenity and quietude of country estate living. 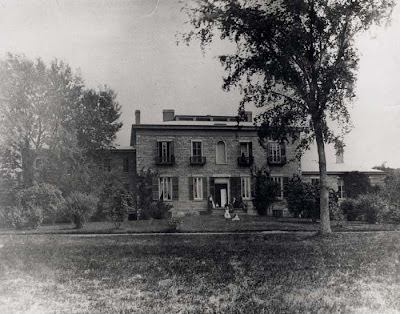 In 1888 the Bartow's children sold the estate to the City of New York as part of the new Pelham Bay Park. The house and its grounds entered into a period of neglect and decay. 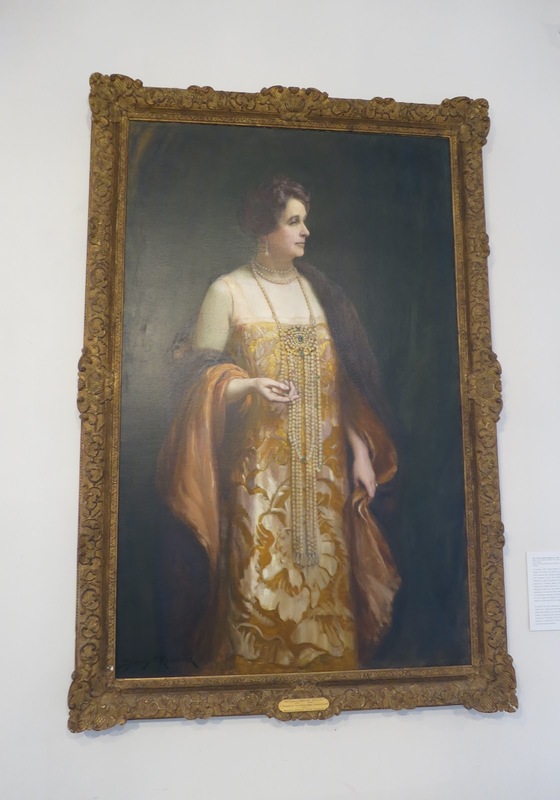 In 1914, the good ladies of the International Garden Club* adopted the mansion as their clubhouse, ensuring its survival at a time when neighboring estates were being demolished. 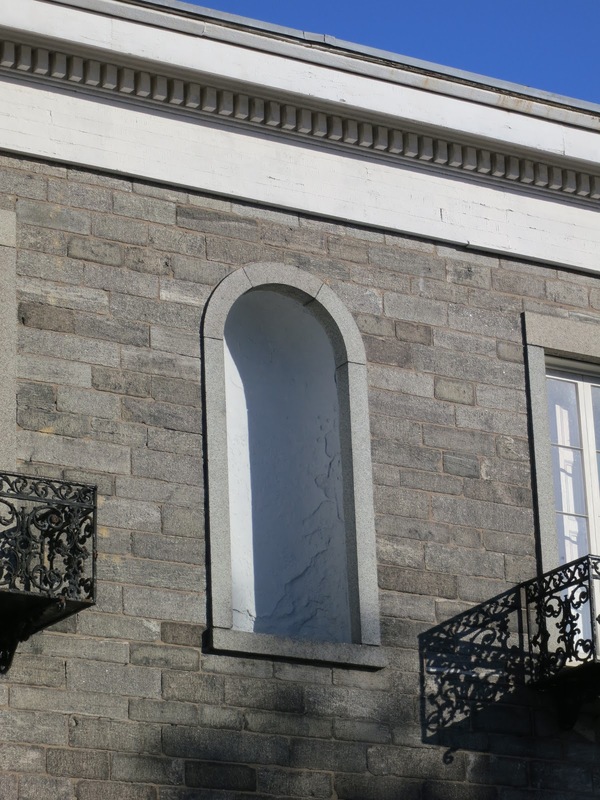 The Garden Club commissioned the architectural firm of Delano & Aldrich to modernize sections of the house and to restore its Greek Revival details. 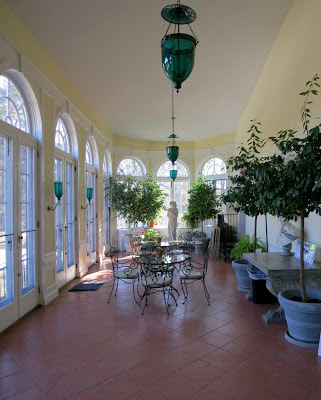 In 1916 the Garden Club installed an elegant walled and terraced garden behind the house, leading out to lawns and fields sloping down to Pelham Bay. Further plans to establish an array of formal gardens were interrupted by the onset of World War I, and were never completed. The Club hired landscape architect Ellen Biddle Shipman to redesign the gardens in 1927. In 1936, during one of the hottest summers on record, Mayor Fiorello H. La Guardia moved his staff north of the city to the house, and directed his affairs of the City from a telephone bank installed in the basement. Ten years later, in 1946, the International Garden Club opened the Bartow-Pell Mansion to the public as a house museum. A late winter's view out over the terraced gardens in the rear of the house. Today, the interiors have been thoughtfully and carefully restored to an approximation of their 19th century appearance. A dramatic, free-standing spiral staircase rises from the house's entrance hall, connecting parlors and the dining room on the ground floor with the family and staff bedrooms above. Mahogany doors open onto spacious double parlors on the ground floor with handsome carved marble fireplaces and tall windows that look out onto the elegant, terraced garden. The house includes a large, Colonial Revival style orangery that was added by the Garden Club during the Delano & Aldrich renovation. that once hung on its windows. 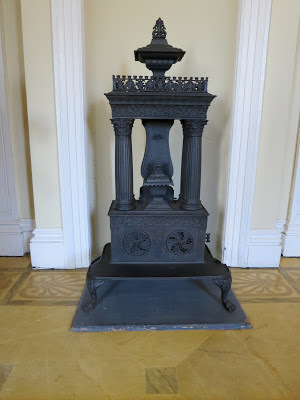 The Bartow-Pell Mansion's interiors are beautifully furnished with period antique furniture made by New York City's most noteworthy cabinetmakers of the early nineteenth century, including examples from the workshops of Duncan Phyfe, Charles-Honoré Lannuier, and Michael Allison, among others. 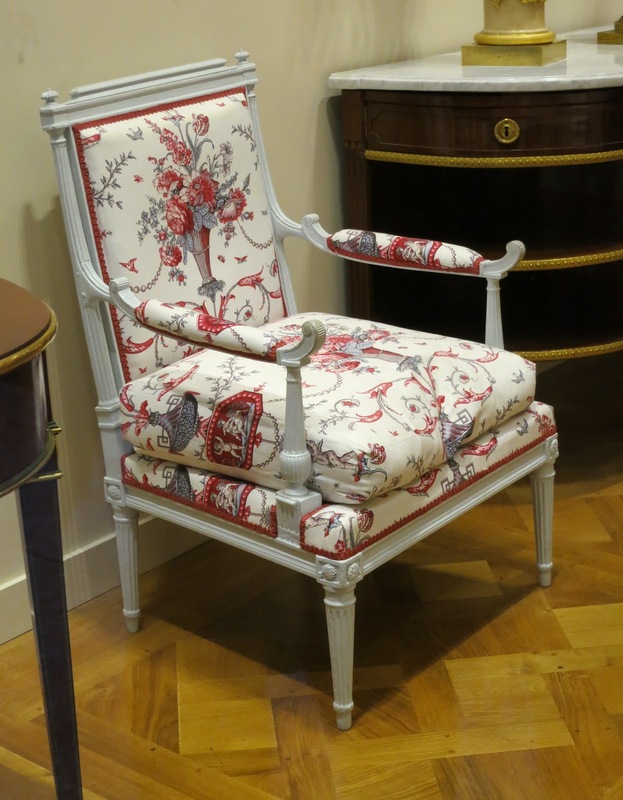 Furniture, decorations, and art have been donated to the house museum and also loaned to it by the Metropolitan Museum of Art and the Museum of the City of New York. The Bartow-Pell Mansion is listed on the National Register of Historic Places, and is both a National Landmark and a New York City Landmark. The house and gardens are still operated by the International Garden Club. 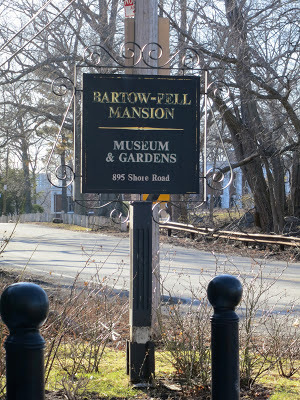 Reggie enjoyed visiting the Bartow-Pell Mansion and its gardens, and he encourages his readers to visit the estate as well. 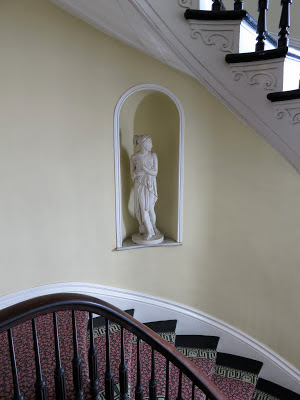 Doing so provides a unique opportunity to take in a rare survivor of refined and elegant country house living by members of the city's highest elite during the middle decades of the nineteenth century. * Reggie has not been able to find any information about the International Garden Club, beyond what is contained on the Bartow-Pell Mansion's website. He would be most grateful to any of his readers who know more about the Club if they would share it with him and his readers. 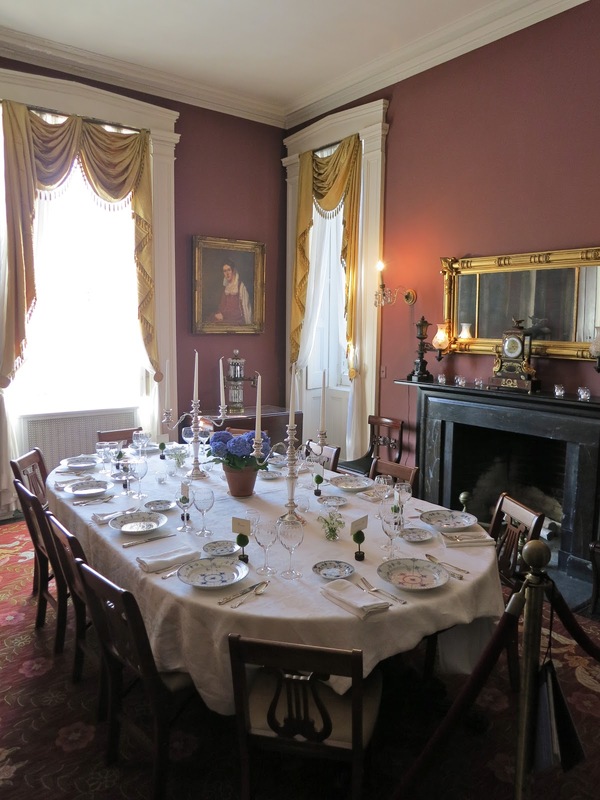 A special thanks to the Bartow-Pell Mansion Museum & Gardens and the Historic House Trust of New York City. Reggie has consulted and relied on resources published by both entities in this posting. Except where noted, all photographs by Reggie Darling and Boy Fenwick. I realized recently that it has been a long time since I've done a restaurant review here on Reggie Darling. It's not that I haven't been going out to eat, Dear Reader, but rather I haven't felt all that compelled to write about the restaurants I've found myself in lately. Don't get me wrong—they have (in most cases) been good restaurants, and in some cases they have been very good restaurants. But each has lacked a certain, well, something to inspire me to take pen to paper (so to speak) and write about it. 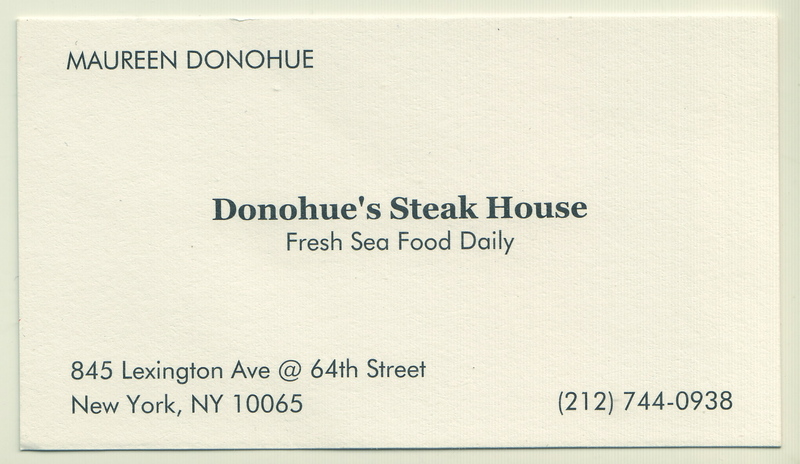 That is until last week, when I had the good fortune to find myself tucking into a tasty dinner at Donohue's Steak House, located on Lexington Avenue in the East Sixties. 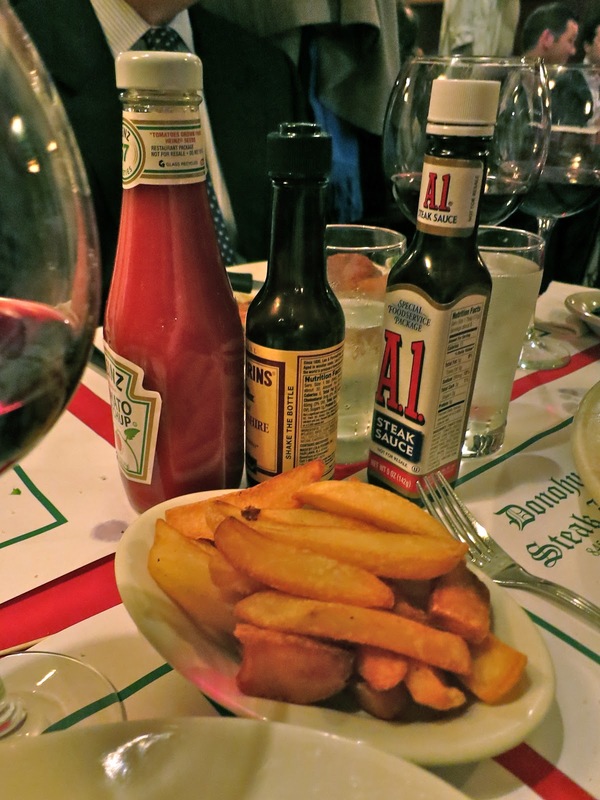 Donohue's is an intimately-scaled (some would say diminutive), old-fashioned chop and fish joint beloved by neighborhood regulars and others for its authentic, of-another-era, New York dining experience. The bar scene as one enters Donohue's. Donohue's keeps 'em coming by serving stiff drinks and straightforward, classic American fare that hasn't changed all that much since the Donohue family first opened the restaurant's doors in 1950. 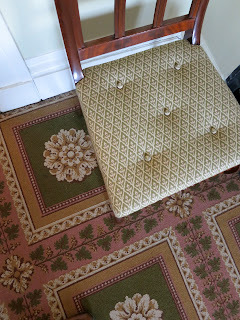 The decor appears to date from then, too, with black, button-tufted vinyl upholstered booths, red table cloths, and black and white checkerboard floors. I understand the interior has been refreshed over the years, but the Donohues have kept it true to how it originally looked. Donohue's dining room, before the evening's rush. Donohue's wood paneled walls are hung with landscapes of the "painted by a real artist" variety, along with a framed newspaper clipping or two about the restaurant dating from when Robert F. Wagner, Jr., was the city's mayor. Donohue's is one of the breed of old-school, old-style, authentic American restaurants that are particular favorites of Reggie's, whose ranks have been sadly depleted in recent years. It is cut from the same cloth as the late, lamented Gino's, which used to stand only a few blocks south of Donohue's on Lexington Avenue. I am happy to report, Dear Reader, that Donohue's appears to be going like gangbusters these days. I hope it remains popular and in business for many years to come. You can have it baked, roasted, sautéed, or broiled! I first ate at Donohue's twenty five or so years ago, when I was taken there for dinner by my friends Preston and Digby, who lived (and still do) in the nearby Manhattan House apartment building. It was with Preston and Digby that Boy and I dined there the night when I took the photographs for this story. I remember being delighted during my first visit to Donohue's to find myself transported back to the "I Love Lucy" era, which even at the time (it was the late 1980s when I first went there) seemed impossibly long ago to me. I loved it! Not surprisingly, the food served at Donohue's—while very tasty and very satisfying—is honest, basic fare. There's nothing fussy, frothy, or trendy about it, and that's just how its patrons like it. I'd characterize the kitchen's output as a couple steps up from pub fare. The restaurant's chalkboard menu pretty much sums it up, listing entrées of steak, pork chops, chicken-pot-pie, broiled fish, and broiled scallops. You can get an order of lamb chops there, too. Donohue's entrées come with the expected sides of mashed, fried, or baked potatoes, or white rice. You'd get a funny look if you asked for brown rice there. Reggie wouldn't be surprised to learn that the vegetables served at Donohue's arrived on the premises frozen. Mind you, Reggie is not complaining—he likes frozen peas! Part of the fun of going to Donohue's (as it is for any restaurant, for that matter) is the people watching. 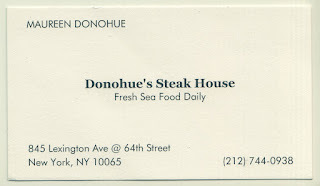 As I mentioned before, Donohue's is popular destination for many who live in its UES neighborhood, any number of which have been regulars there for many years, and some of whom may even remember the restaurant from shortly after it opened. It is not unusual to see several canes hanging among the coats there. But not everyone sitting in Donohue's booths is a card-carrying member of AARP, Dear Reader, for the restaurant is a favorite of patrons under forty, too, who—like Reggie did when he was that age—appreciate the restaurant's strong drinks, hearty, reasonably-priced food, and "other era" charm. Our friends Courtney and Lowell, who are probably one of the hippest young couples we know, are fans of Donohue's. One needn't be budget-minded to appreciate Donohue's, though. I once saw David Rockefeller, who lives around the corner, eating dinner there one night. And our friends Preston and Digby told us they had once seen Kitty Carlisle Hart dining there with Elinor Gordon, the subject of an earlier post of mine. I once sat in the next booth to a young man who was at the time much in the news for having allegedly violated securities laws, and who was packed off to prison for it shortly thereafter! A lingering last look back through Donohue's window. While Reggie is not what one would call a regular at Donohue's, he is always happy to find himself there dining with friends, and he always leaves it satisfied—liquored-up, contentedly full, and ready to totter off to bed. For those among his readers who appreciate the pleasures of such old-school dining establishments, Reggie highly recommends it. Please note, Reggie has received nothing in return for writing this review nor does he expect to in the future. 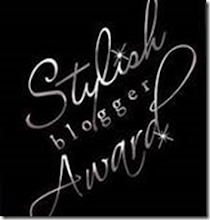 He is writing it solely for the pleasure of his readers, which is why he writes this blog in the first place.